We did it! We opted for a signage upgrade. Our signage upgrade was a great decision, but it’s not the first time. 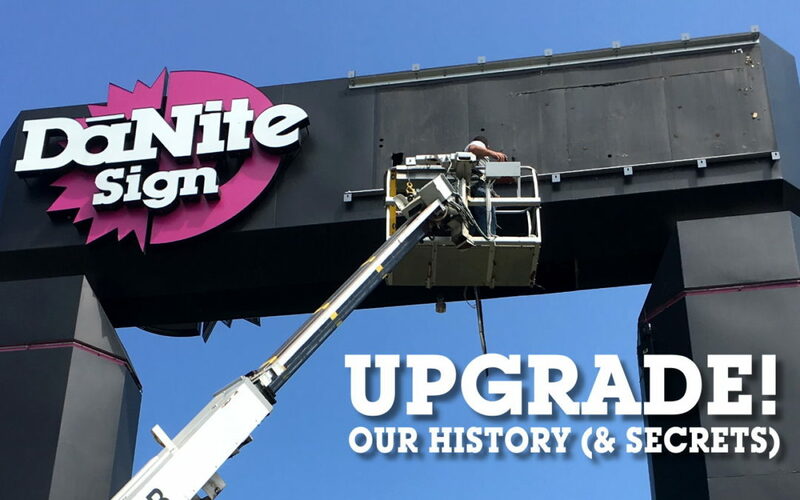 The DāNite highway sign has been through multiple upgrades over the years. Check out the short video at the end of this article! A signage upgrade could mean swapping out neon for energy saving LED. You could replace a manual reader board with an electronic message center, or replace an outdated message center with a brand new one. 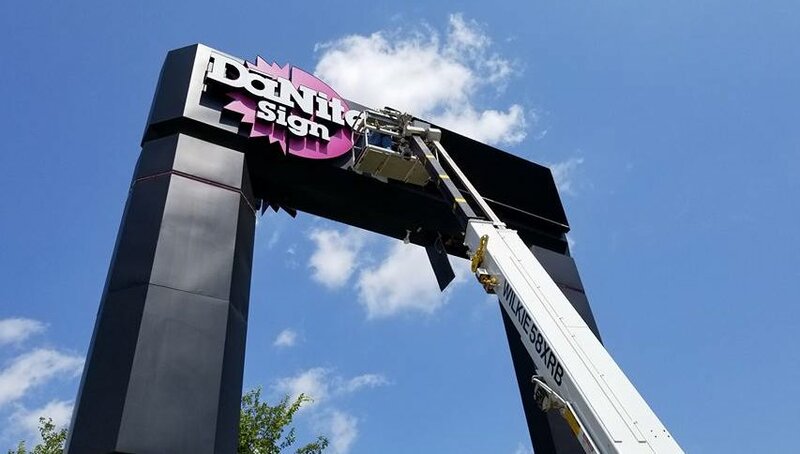 And don’t rule out updating your sign faces with a new company logo, changing out the faces on your channel letters, or taking an old sign from blasé to ooh-la-la with a fabulous new design. 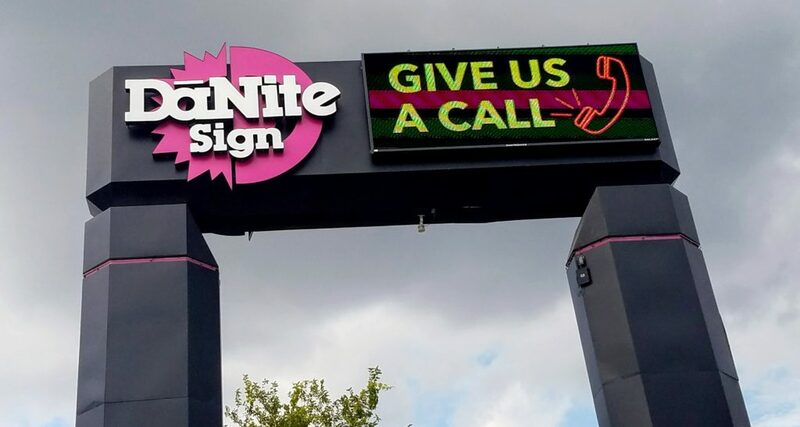 A good sign company will consult with you on how to get the best results and the most bang for your buck. What ever you decide to do, the commuters who pass by your sign every day will notice! Installer Dan Baker snapped a shot from the top of the DāNite highway sign. The old logo and incandescent bulbs are indications of just how much time passed between the setting of the poles and foundation, and the installation of the sign itself. The reason for that? 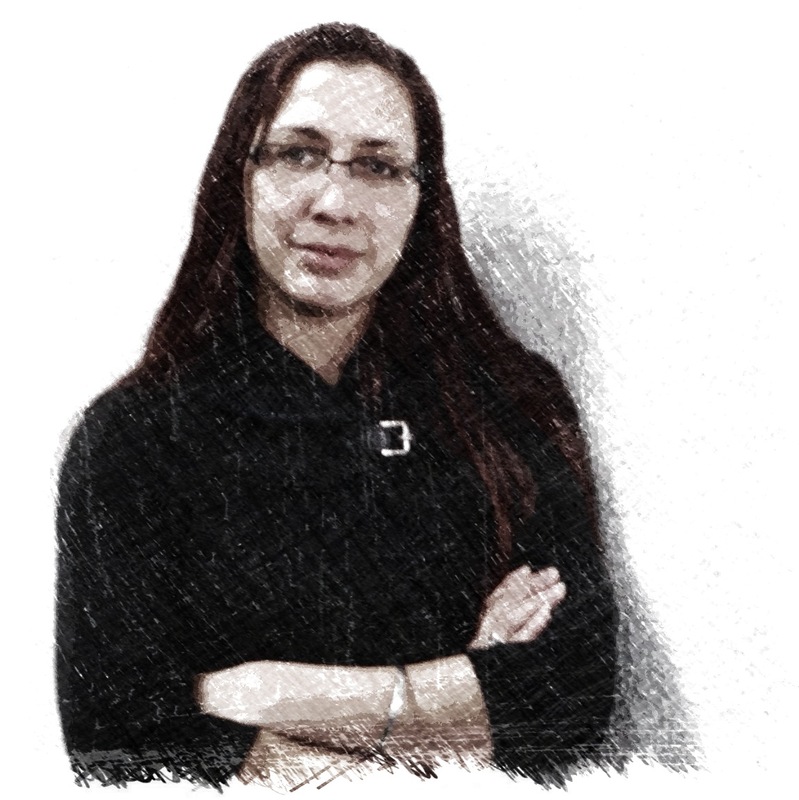 DāNite was absolutely swamped with client work! Previous owner, Cal Lutz, used to joke with his competitors saying, “You’ll know we’re not busy when our sign finally goes up.” It wasn’t until 1992 that designer Thad King (still designing for DāNite today), updated Puckett’s drawing with a more modern electronic message center and his new sun/moon company logo. King also added fuchsia neon to the pole covers and logo. That sign WAS installed. But it wasn’t long before changes were made. Shortly after the sign was installed, a prospective client stopped in after seeing DāNite’s message center from the highway. He said “I want a message center exactly like THAT.” So Cal Lutz sold it to him… that exact message center. Lutz had been thinking that the original monochrome message center was too small and limiting since it was installed. He jumped at the opportunity to sell the used DāNite message center to AAA Antique Mall in Ravenna. It made everyone involved happy, and the Ravenna EMC is still in use today. DāNite then installed a full color Daktronic’s message center. One that Lutz could spontaneously update from his home computer during OSU football games. Bigger changes were still coming for the highway sign. Or perhaps “taller” is more appropriate. The City of Columbus built the Franklinton flood wall along the back end of DāNite’s property a handful of years after the sign was installed. It required that the sign be raised a whopping 17 feet to be view-able from the highway. Luckily, the poles and foundation had been engineered for a much larger sign, which allowed for the unexpected additional height. Since the bottom half of the sign could not be seen from the highway there was no need to extend the decorative pole covers to the ground. Amusingly, from the perspective of DāNite’s backyard, the bottom half of the sign has extremely skinny I-beams for legs. At least they look skinny when compared to the 6′ 8″ wide pole covers that the public can see. Its a great big sign with chicken legs! 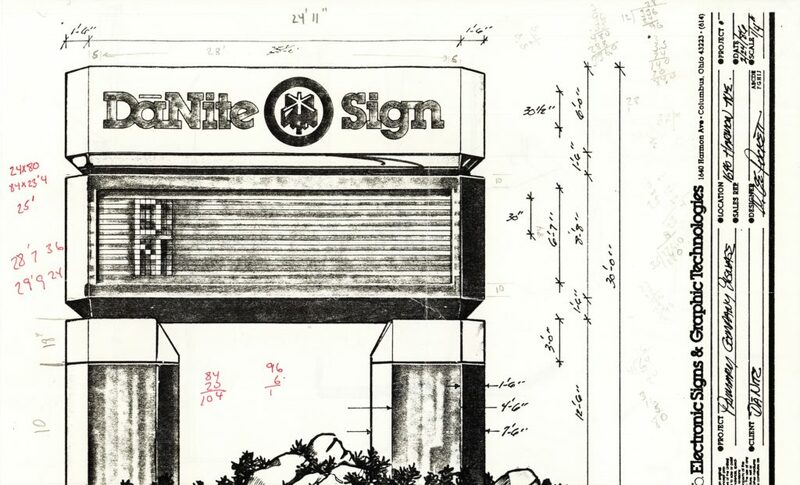 Just as an aside, DāNite designed and installed the Ricart Auto Mall sign in 1999 and it was drawn with nearly the exact same body style as DāNite’s highway sign. Of course, that is where the similarities stop. Ricart’s pole covers actually go all the way to the ground. 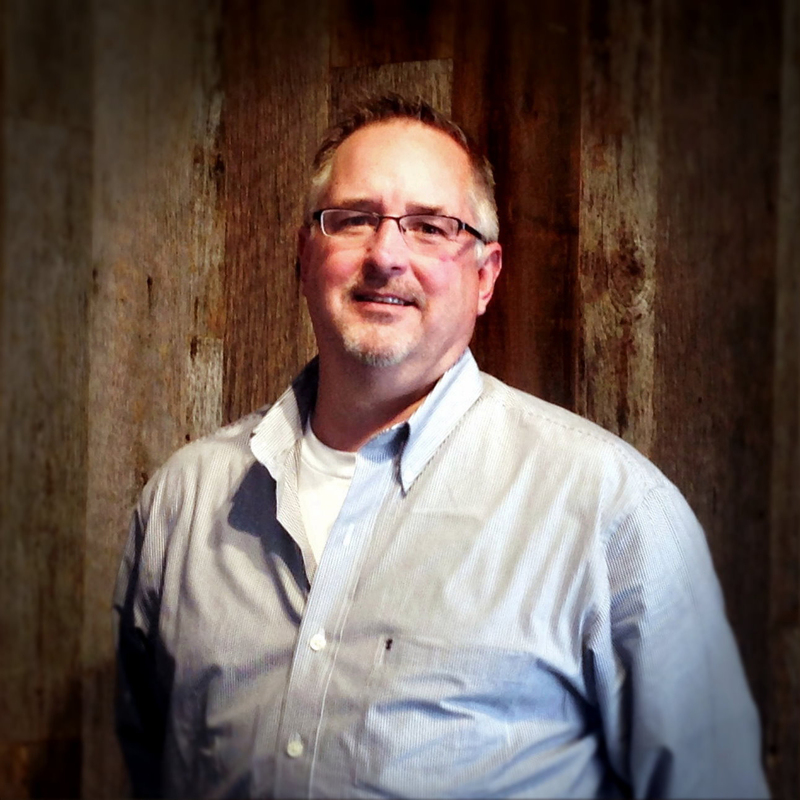 Tim McCord bought DāNite Sign Company from Cal Lutz in 2007. 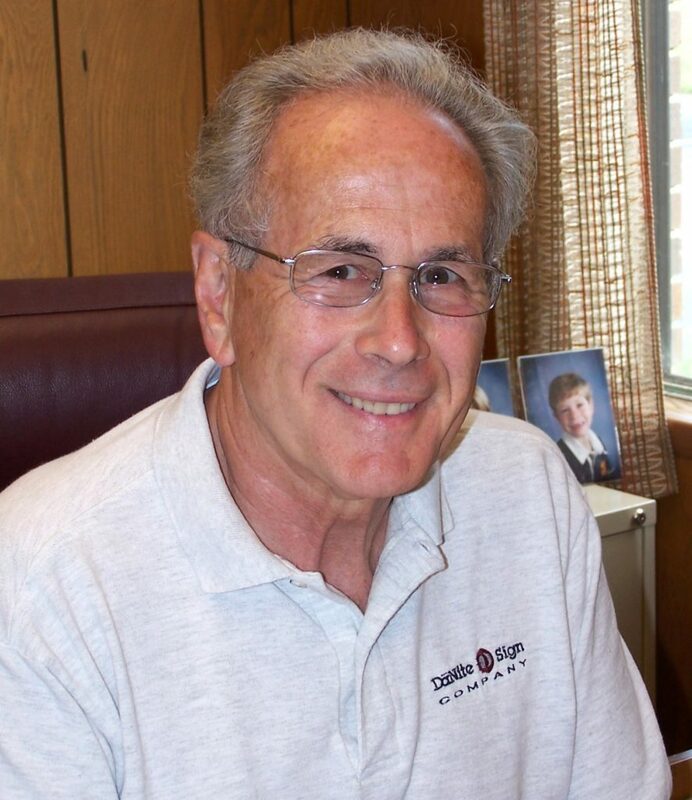 By 2011, the technology for LED-illumination had advanced so rapidly that he decided the business would benefit from retrofitting the sign to the super bright and energy saving LEDs. White faces were cut from old router files for the open-faced neon channel letters on the sign, and the neon accents on the pole covers were converted to LED-tubing. 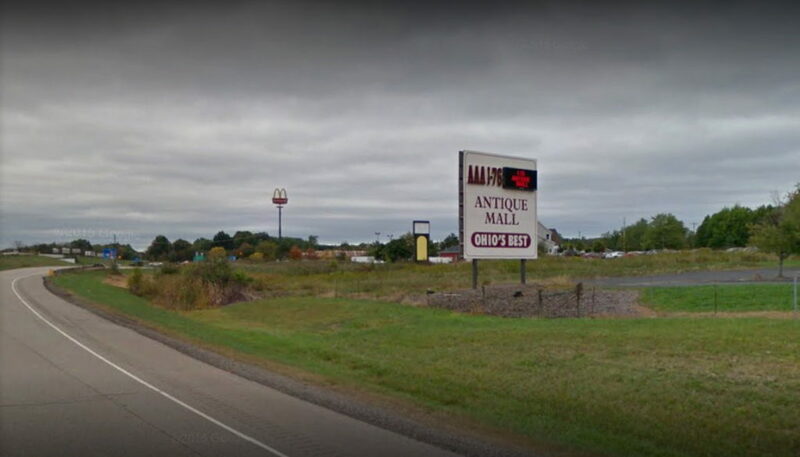 The 2011 signage upgrade made the sign far more visible from a greater distance on the highway. While LED tech was advancing rapidly, computer tech could be described as a speeding bullet. To take advantage of the newest Electronic Message Center technology, DāNite started shopping for the next big thing. The sign’s new displays improved the pixel pitch (distance between LEDs) from 32mm to 16mm. That is a staggering improvement in clarity! 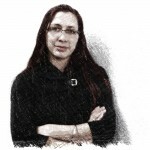 Web-based software allows employees with password credentials to control the sign from any internet connected device. Also, for the first time in history, there are now message boards on both sides of the sign! The new message boards were bigger than the old ones though. 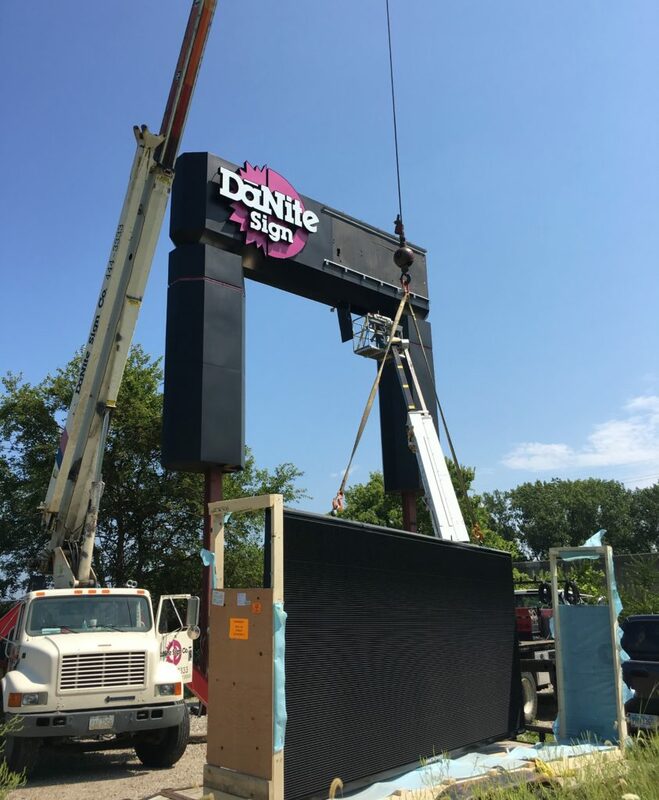 Thad King and Jennifer Bender worked together to re-configure the DāNite logo so it would fit in the available space and still feel like a prominent part of the sign. 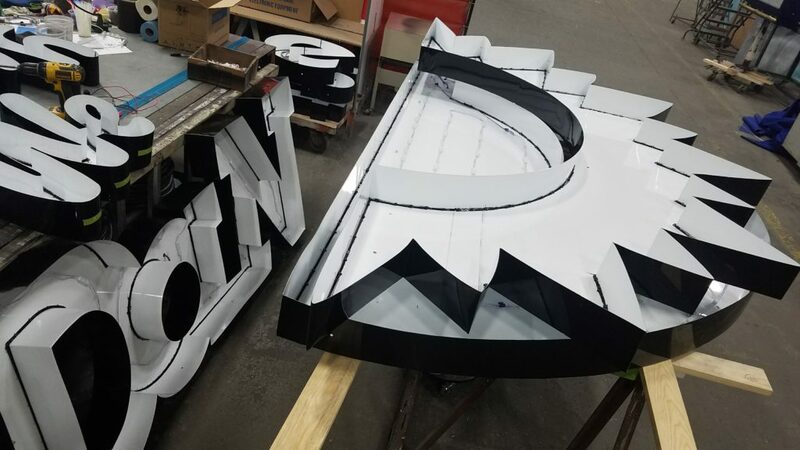 A great big thank you to DāNite employees Michael Cox, Sr., Thad King, and Tom Seymour, for filling in the blanks on the long history of DāNite’s Highway Sign. DāNite Sign Company is exceptionally proud of the most recent signage upgrade. 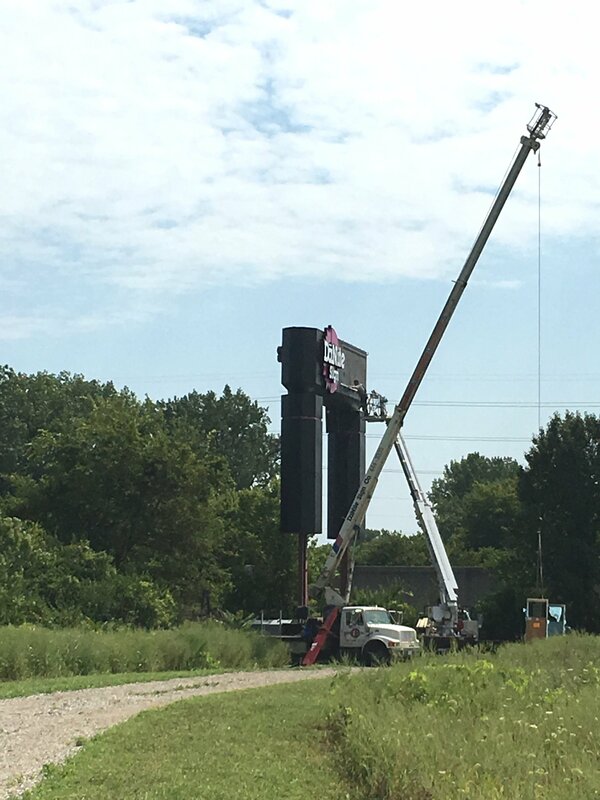 Look for it as you drive down I-71 just South of Columbus near the Greenlawn Road exit.Watch more about the sign’s changes and upgrades throughout history in the video below!